Brief Synopsis – The story of the taming of the west spanning 3 generations of settlers. My Take on it –This was one of the first ever Epic ensemble films. 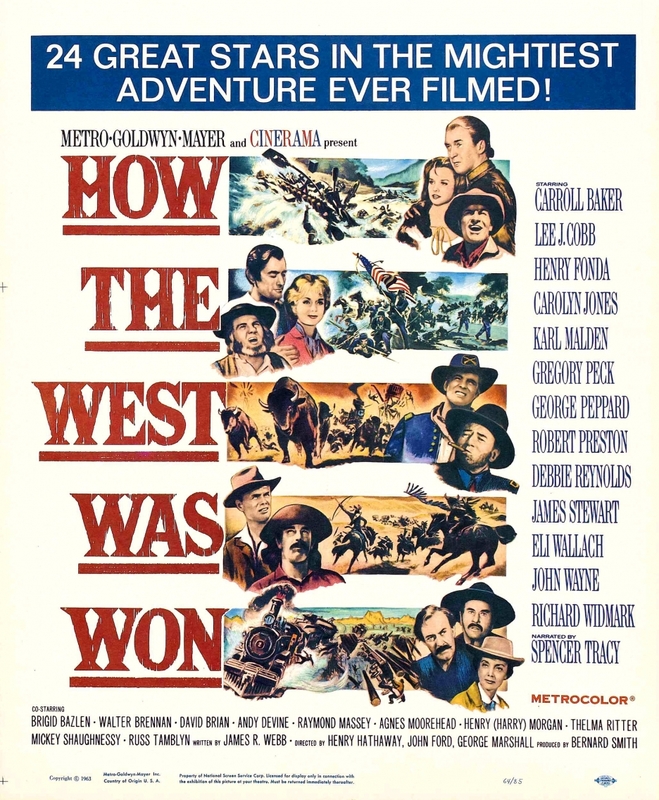 John Ford took all his actors from over the years and tried to make the prefect western. Unfortunately, he didn’t fully success and only got most of the way there. This movie is great, but the problem is that in it’s 164 minutes, it tries to tell 5 interwoven stories, but due to time constraints it all feels too rushed, and this movie suffers because of that. Ford was able top get his cast wish-list since he was a well respected Director and this movie ended up with 24 stars appearing for varying amounts of time. Those with the most amount of screen time are Jimmy Stewart, Karl Malden, Gregory Peck, Henry Fonda, George Peppard, Robert Preston, Carroll Baker and Debbie Reynolds. Smaller roles were had by John Wayne, Harry Morgan, Richard Widmark, Eli Wallach, Lee J Cobb, Walther Brennen, Raymond Massey and Andy Devine. The movie was narrated by an ailing Spencer Tracy. The stories are truly interesting and it’s too bad that Ford didn’t try to make each part it’s own full-length movie. Bottom Line – Great epic movie featuring an all-star cast, seems a bit rushed tho. Recommended! Now that is an all-star cast. I think it would be real hard to top that one.